This week's literary news from the Nordic countries, the UK and Israel. The week is nearly over, which not only means it’s the weekend but also that it’s time for our literary catch-up! For this edition, Blog Editor Hanna Heiskanen shares updates on the upcoming awards season, among other news from Scandinavia. Editor-at-Large Julia Sherwood then reports on literary happenings from the UK. Rounding it all up is our correspondent for Israel, Alma Beck, currently residing in New Orleans, where she teaches philosophy for children. Obligatory reminder: After you’ve caught up with all the news, head over to our just-launched Fall 2016 issue here! Lars Huldén, the Swedish-speaking Finn poet, has passed away at the age of 90. Born in Pietarsaari, Finland, Huldén was a much loved and highly regarded writer, scholar, translator, and recipient of the Swedish Academy Nordic Prize in 2000. He grew up among a tradition of oral storytelling in the local Swedish dialect and worked tirelessly throughout his adult life, publishing a large collection of poetry, prose, plays, and sonnets, among other works. He also produced Swedish translations of Finnish and English classics, such as the Finns’ national epic, Kalevala, and Shakespearean texts. Finnish Literature Exchange (FILI) is accepting applications for grants until November 1. If you are a publisher, translator, author, or event organizer interested in working with Finnish literature, FILI has a handy guide on their site to guide you through the options. FILI, founded in 1977, hands out approximately 700,000€ worth of grants annually, in addition to hosting translator residencies and maintaining a database of translations of Finnish literature. This year’s Stieg Larsson prize will be awarded to the Malaysian researcher and women’s rights activist Jac sm Kee in Stockholm on November 14. Named after the massively popular Swedish crime writer, since 2010 the prize has awarded 200,000 Swedish Krona to “a person or organization, working in Stieg Larsson’s spirit.” Jac sm Kee is the manager of Association for Progressive Communications Women’s Rights Programme (APC), an organization that supports access to the internet to develop local communities and support social movements. It’s also awards season in Norway, which is waiting to hear who will receive the 2016 Norwegian Booksellers’ Prize on November 15. Nominees include Samuel Bjørk, Ketil Bjørnstad, Lars Saabye Christensen, Roy Jacobsen, and Maja Lunde, all of whom have been translated into English. Denmark is abuzz with the news that large media outlets and dozens of bookshops have been banned from publishing or selling a book containing interviews with the country’s domestic intelligence agency’s (PET) former chief, Jakob Scharf. The decision, highly unusual and dubbed a crusade against free speech, was made by a Danish court. And to wrap up, the Danish classic, Tom Kristensen’s novel Havoc (1930) has been published in a new English translation by Nordisk Books, a recently launched, London-based publisher of Scandinavian literature. We look forward to seeing more details of their list! From October 5-16, South Bank Centre hosted the star-studded London Literature Festival, featuring a broad range of emerging international authors including China’s most celebrated science fiction author, Cixin Liu, and award-winning Iraqi author Hassan Blasim, who imagines his homeland one hundred years into the future, to make a line-up of intergalactic proportions. Other literary greats included Lauren Beukes, Naomi Alderman, Michel Faber, and Teju Cole, as well as Margaret Atwood, who received the 2016 PEN Pinter prize for her political activism, and being an “exemplary public intellectual.” On October 13 Margaret Atwood conferred the International Writer of Courage award on Bangladeshi writer, publisher and activist Ahmedur Rashid Choudhury (known as Tutul). On October 10 at the Stoke Newington Bookshop, Lucy Popescu presented A Country of Refuge, of which she is the editor. A new anthology of fiction, memoir, poetry, and essays on asylum seekers from some of Britain and Ireland’s most influential writers, it’s a book whose relevance increases every day as the debate about immigration continues to inflame feelings around the UK. On International Translation Day (ITD), celebrated on September 30, the British Library conference centre was abuzz with the translating community, which has come together for the seventh ‘gathering of the clan,’ as Daniel Hahn calls it, organized by the Free Word Centre. The day ended with the announcement of the eight writers who have been awarded places in the coveted Emerging Translator Mentoring Programme 2016, run by the Writers’ Centre Norwich. One of the lucky ones, Marta Eidsvåg (Norwegian) is also the winner of this year’s Harvill Secker Young Translators’ Prize. Following ITD, a small focus group met on October 14 for the first of a series of co-designed workshops between London’s Free Word Centre and Authors & the World research hub, a Lancaster University project that aims to interrogate the literary, social, political, linguistic, and historical significance of the author as a cultural artifact and a producer of literary texts. October 11 marked a year since the arrest of Palestinian poet Dareen Tatour, bringing about an outpouring of support from hundreds of writers and cultural figures from around the world, including four Israel Prize winners and nine Pulitzer Prize winners. Tatour, 33, a Palestinian with Israeli citizenship, spent three months in Israeli prison followed by months under house arrest, after being indicted with charges of incitement to violence and “support for a terrorist organization” for her poem, “Resist, My People, Resist them.” The poem was published and recited in a video on Tatour’s YouTube channel, accompanied by a display of assembled footage of IDF activity in the West Bank and anti-occupation protests, including images of masked Palestinians throwing stones at IDF soldiers. While Israeli authorities deem Tatour’s poem as stirring terrorists into action—citing lines such as, “Resist the settler’s robbery / And follow the caravan of martyrs, and, I will not succumb to the ‘peaceful solution’ / Never lower my flags / Until I evict them from my land”—Tabour continues to defend her poem as a legitimate protest against the occupation, claiming it was written as a response to cases of Israeli aggression and terrorism. And Tatour is not alone. In a petition initiated by the organization Jewish Voice for Peace, hundreds of people have pledged their support for Tatour, urging the Israeli government to drop all charges against her. This list includes some prominent members of the international literary community such as Alice Walker, Dave Eggers, Naomi Klein, Russel Banks, and recent Pulitzer Prize winner Viet Thanh Nguyen, as well as celebrated Israeli writers A. B. Yehoshua, David Grossman, and Tuvya Ruebner. 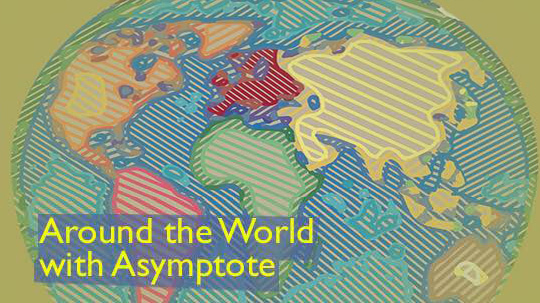 Read More from the Asymptote team!